When a new Hearthstone expansion approaches, the question of what to play on day one always lingers. But while it takes a while for the meta to settle, there are always fun new options introduced by the expansion that need to be tried out right away. Hearthstone pros and members of theScore esports' sizeable Hearthstone fan contingent have assembled some Day 1 Decks for you to try while you wait for the top-tier contenders to emerge. It remains to be seen how strong these lists are, but you'll have a blast giving them a shot. It's no secret that AKAWonder is a fan of the Warlock class, and while this isn't one of his signature handlock builds, it definitely uses some of the set's newest ideas to the fullest. Survive the early game with the deck's extensive removal package — including the volatile Defile, added in this expansion. Thalnos gives Defile even more reach, and you get to draw a card. Then, in the late game, you can play Krul to get an initial wave of demons from your hand. If your minions fall, get them back by playing Bloodreaver Gul'dan and abuse that disgusting new hero power to keep the board clear and sustain yourself. The Lich King is also a good late-game value proposition if you can defend him. We asked Hearthstone professional Thijs "Thijs" Molendijk to come through for us with a fun day-one decklist, and he delivered. Using the new Death Knight Hero Card for Warrior, Scourgelord Garrosh, collateral damage isn't just a fact, it's a benefit. While the deck should be able to seize tempo through a number of high-value effects, it also has potential finishers in Grommash Hellscream, The Lich King and Rotface. Card draw from Battle Rage and Acolyte of Pain, combined with the weapon retrieval from the new Forge of Souls, should prevent the deck from running out of steam. Daniel Rosen: Reno might be dead, but Highlander Priest can still live, thanks to Shadowreaper Anduin's ridiuclous hero power. If you can get Raza the Unchained out before or after you go full Voidform, your zero Mana hero power is one of the strongest in the game and combined with Lyra the Sunshard, it's effectively I N F I N I T E V A L U E.
Of course, that all relies on you drawing those cards, having them on the board at the right time, and not dying before it all goes down. 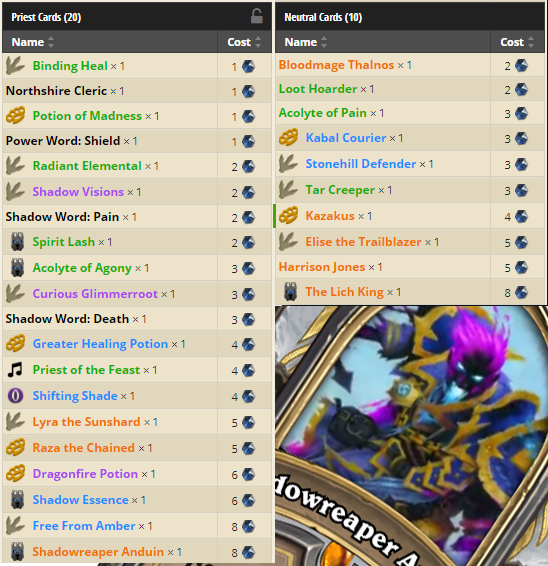 I'm praying for a control meta, just so I can annoy the hell out of some control warriors with this deck. Josh Bury: The cinematic trailer for WoW's Wrath of the Lich King expansion saw Arthas summon forth not only his undead legions, but also his Frost Wyrm, Sindragosa. The addition of some new neutral dragons gives Paladin the ability to do bring back some dracoliches as well — and while Sindragosa is a Mage card, there's always the chance you could discover it! Added to the core Dragon value package are some of the class's new options. Combined with tons of taunts and healing, Uther of the Ebon Blade gives a potential win condition. 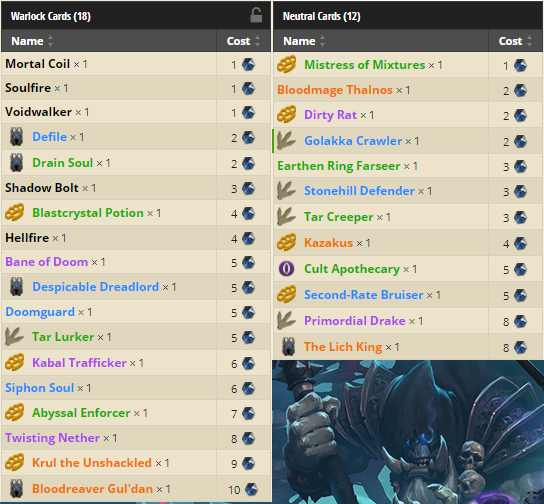 The Lich King, Cobalt Scalebane and Ragnaros, Lightlord all benefit from Drakkari Enchanter, but one or both could be teched out for Nerubian Unraveler given the deck's limited spell selection.